We promised in our book to publish our Performance. Here it is! The authors are proud of their individual investment performance - and are equally proud to advocate for the individual investor. In our book, we promised to publish the results of the Buy and Hedge portfolio that we manage. The results below are more than just any Buy and Hedge portfolio. These are the investment returns for 100% of the discretionary investable assets of one of our co-authors: Wayne Ferbert. Wayne has been investing using hedges exclusively since January 2008. We promise to keep updating the data as we want to be transparent about the power of the Buy and Hedge approach. Chart Description: Chart calculates the Time Weighted Returns for the Author's Portfolio for the Time Period indicated. The Time Weighted Returns are calculated using GIPS standards. The S&P 500 ETF is symbol SPY and the dividends are always re-invested back in to the SPY ETF upon the ex-Dividend date. The chart multiplies $10,000 times the Time-weighted return percentages to show the growth of $10,000 invested in the indicated strategy. 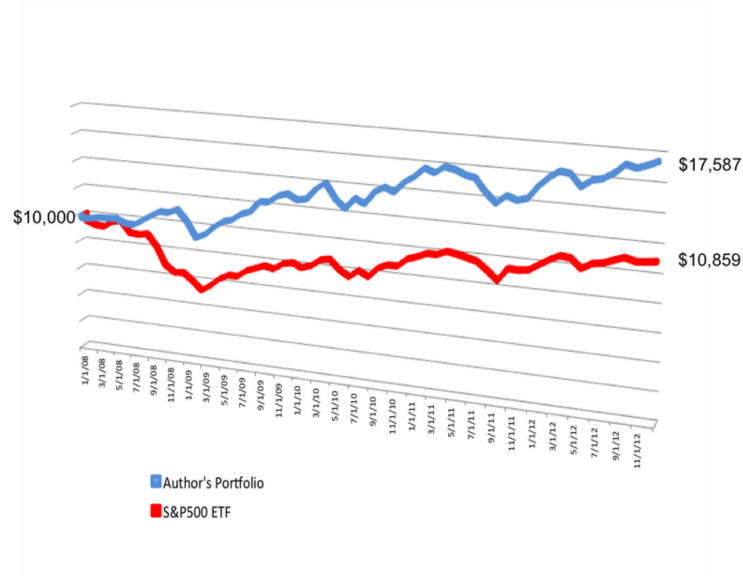 The author's GIPS time-weighted returns were calculated using every investment account the author managed himself with the exception of his 401k which had investment options that were too limited to hedge effectively. As soon as the 401k was transferred to an IRA account controlled by the author, then the returns from that account were included in the time-weighted return from that date forward. Further, the author stipulates that one other account that is not hedged is the only account that the author controls that is not included in these returns. That account is invested in alternative strategies and represents less than 5% of the author's total investable assets. Performance results are presented net-of-advisory fees and reflect the reinvestment of dividends and capital gains. Past performance may not be indicative of future results. Therefore, no investor should assume that the future performance of any specific investment or investment strategy will be profitable or equal to past performance levels. All investment strategies have the potential for profit or loss. Changes in investment strategies, contributions or withdrawals may materially alter the performance of your portfolio. Different types of investments involve varying degrees of risk, and there can be no assurance that any specific investment will either be suitable or profitable for an investor’s portfolio.